If you want to get a high-quality education you’ve probably asked yourself a question “What university should I go to?” It’s obvious that alongside to incredible educational experience, a college will provide you with an opportunity to meet new people, establish new relationships and advance your future career. 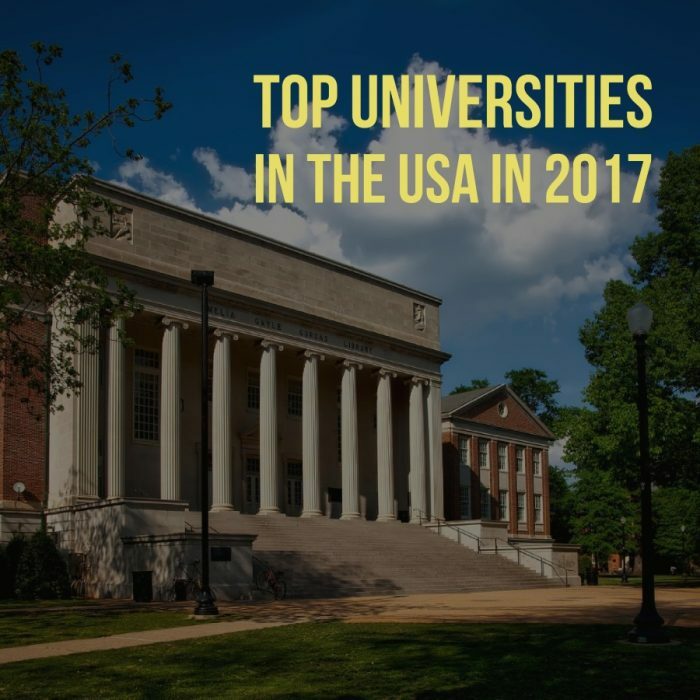 To make a right choice, have a look at the list of top institutions of higher education in the United States in 2017. Located in Cambridge, Massachusetts, MIT focuses on technology, computer science, as well as engineering. Current research and education areas incorporate various fields. You can study digital learning, nanotechnology, sustainable energy, the environment, climate adaptation, cyber security, robotics, and artificial intelligence. MIT offers fair scholarships that help to cover 100% of tuition for students from families that have low income. Do you want to become an engineer or computer scientist? It’s a great place for you. Some people picture the MIT as a place where people do science or engineering all the time, and nobody has real fun, but the MIT student life shows that there’s much more to MIT than just academics. Situated in the well-known Silicon Valley, Stanford University has an amazing history which is rich and inspiring. As an undergraduate student, you can explore more than 65 major fields of undergraduate study there. This institution is particularly well-known for its business courses. The Stanford School of Medicine is the world leader in medical training and research. Stanford’s campus contains splendid architecture, sculpture gardens, and museums and is considered to be the most beautiful in the world. It’s the most attractive place or students ever. The heart of campus life is White Plaza and its famous Claw Fountain. If you are interested in visiting Stanford you are more than welcome to do this – its visitor center hosts 150,000 guests annually. Being the oldest higher educational institution in the US, Harvard is perhaps is the most famous institution of higher education in the world. Harvard is located in Cambridge, Massachusetts. Despite the fact that it is quite expensive to pay for tuition, Harvard provides financial aid and scholarships for students. Here students are exposed to the large library system. Harvard’s library is made up of 79 different libraries, and it is thought to be the biggest academic book repository in the world. Unlike some other schools, Harvard is equally reputed for arts and humanities as well as for science and technology. Caltech is based in Pasadena, California and was founded in 1891. Caltech’s motto is “The truth shall make you free.” The institution focuses on science and engineering and offers its programs to both undergraduates and graduates. At California Institute of Technology, a half of full-time undergraduates receive scholarship or grants. Moreover, it provides nonremedial tutoring, health service, and insurance. As to the accommodation, students can live either in self-governing groups or campus. If you are a student who wants to chase after new knowledge about our world and search for the kinds of innovative advances that will transform the future, then California Institute of Technology waits for you to apply! The University of Chicago, situated in Hyde Park, offers a rich campus life in a big-city setting. By the way, it’s where Barack Obama lives. The institution is affiliated with 89 Nobel Prize winners. Besides, there’s a great athletic center where you can find two floors of fitness rooms and large pool. The University of Chicago is famous for its club teams that allow students to get involved in sports and meet other students from the college. Juniors can also hang out in Chinatown near campus. Students are required to live in the residence house for the first year of college, but after that, they have a choice to change a place where they want to settle. Many people enjoy the student years in the school, and you can join them too. Princeton is a prestigious university, located in the quiet town of Princeton, New Jersey. It known for its preeminent academics, superiority in research and exceptionally successful alumni. The acceptance rate here is around 7%. Within the walls of its historical, ivy-covered campus, students can obtain knowledge in humanities, social sciences, engineering and natural sciences. Degree courses in the institution have strictly specified requirements. All students have to do independent research as part of their degrees, and some must take a foreign language course. In general, Princeton offers a number of events, activities, and organizations. Innovation and internationalization describe Yale University the best. Yale is particularly competitive in law and legal studies, English language, and literature, history, politics, arts, and humanities. Based in New Haven, Yale was founded in 1701. Yale University gives you an opportunity to do whatever you want, as here are tons of different extracurricular groups especially for those who are interested in sports and singing. This is a place where you can have a career path in almost everything, find the skills, the inspirations, the people who will coach you to get you where you want to be. Do you like reading? Memorial library which contains lots of study rooms is the largest in the US and is available for Yale students anytime. When you want to have a break from a study you can have a walk-in art gallery or hang out on campus. Located in Ithaca, New York, Cornell University ranks second in the world for veterinary science. Applicants can choose between such majors as engineering, biological and biomedical sciences, business, management, marketing, and related support services and social sciences. Cornell is a large school which an be a little bit of daunting when you are a freshman. However, it’s also amazing meeting new people and figuring out your niche. As any of the outstanding universities, Cornell has many activities for those who want to relax after studying. This higher institution has a beautiful campus, which is quite close to nature and it’s something you cannot find in other colleges. Build in 1876, John Hopkins University is the first research institution in the US and is famous for research and teaching in the life sciences and medicine. The most popular majors at Johns Hopkins University are public health, bioengineering and biomedical engineering, international relations and affairs, neuroscience and economics. Yes, if you want biomedical engineering – this is a great school to be in. But if you want a creative writing – this is also a great place to consider. The University of Pennsylvania is Located in Philadelphia, and it’s another school which is highly regarded for life sciences and medicine. By the way, Noam Chomsky is a UPenn alumni. The classic gothic architecture style throughout the campus will take you back in 1740 when the university was established. The school also offers a number of clubs and organizations, ranging from performance groups like the Latin and Ballroom dance club to student publications. This higher educational institution is one of the top schools in terms of academics, professors, and course opportunities. Columbia University was built in 1754 in the City of New York. This school allows students to share their thoughts with someone who is a world expert in a field and people within their age range. Did you know that Columbia’s 309 lecture hall is home to the most Hollywood movies? You’ll have a possibility to study there. Among all majors, the most popular are engineering, social sciences, English language and foreign languages, literature, and linguistics. It’s a great choice, isn’t it? Columbia offers financial aid and the average need-based scholarship to 49% of full-time undergraduate students. By gathering people from other parts of the US and from all over the globe, the campus has become an entire world for its citizens. Established in 1817, the University of Michigan is a public research university located in the city of Ann Arbor, Michigan. Ann Arbor is a town known for its lively arts scene, culture, parks, and restaurants, so, you as a student won’t be bored there. You will enjoy living in the iconic U-M campus. There you will find talented faculty members and students from all over the world, unique perspectives, opportunities, and events. The most popular majors at this school are business administration and management, economics, experimental psychology, physiological psychology/psychobiology and political science and government. Do you love sports? Then, you will definitely have an opportunity to join club sport and fitness activities with other students and faculty. Hope you enjoyed this little tour and you are ready to make an important decision in this period your life!